It's the first day of Spring, which means one thing: Spring cleaning. We've got 45+ deals that'll help you clean out your old gadgets and pick up some sparkly new ones—without cleaning out your wallet. • 22'' Soyo LCD Widescreen Monitor for $109.95 (normally $169.95 - use these rebate forms). • 23'' Samsung Widescreen Flat Panel LCD Monitor for $199.99 plus free shipping (normally $279.99). • Lenovo IdeaPad Y430 Dual Core with Webcam for $399 plus free shipping (normally $699 - use coupon code USPIDEAPROMO). Sorry—deal may be expired. • Logitech EX 110 Standard Cordless Desktop Keyboard and Mouse for $20.99 plus free shipping (normally $29.99 - use coupon code EMCLPNL47 and this rebate form). • 6-Foot HDMI Cable for $1.26 (normally $4.99). • Imation Apollo 250 GB Portable Hard Drive for $47.79 plus free shipping (normally $79.15). • 1TB Western Digital Caviar SATA Hard Drive for $88.50 plus free shipping (normally $104.99). • 1TB Iomega eGo USB External Hard Drive for $95.99 (normally $119.99 - use coupon code LX8C0K06PDQ3DC). • 1TB Seagate FreeAgent External Hard Drive for $100.79 (normally $125.99 - use coupon code LX8C0K06PDQ3DC). • 1TB Cavalry USB eSATA External Hard Drive for $99.99 plus free shipping (normally $109.99). • Microsoft Xbox 360 20GB System (Factory Reconditioned) for $139.99 plus free shipping (normally $249.99). • Little Big Planet on PS3 (PAL) for $19.95 (normally $59.99 - valid through 4/13). • Rock Band 2 Bundle on Xbox 360 for $159.99 plus free shipping (normally $189.99). • Saint's Row 2 on Xbox 360 for $31.99 plus free shipping (normally $56.99). • Far Cry 2 on PC for $17.99 plus free shipping (normally $27.99). • Spore Galactic Edition on PC for $26.99 plus free shipping (normally $49.99). • Tom Clancy's End War on PS3 for $24.99 plus free shipping (normally $36.99). • Fallout 3 Collector's Edition on PS3 for $52.99 plus free shipping (normally $77.99). • MSI GeForce Express Video Card PLUS FarCry 2 Game for $99.99 (normally $159.99 - use this rebate form). • Abe's Oddworld Games for $2.50-3.75 (normally $9.99-14.99). • 42'' Vizio 1080p Flat Panel LCD HDTV (refurbished) for $599.99 (normally $899.95). • 32'' Vizio 1080p LCD HDTV for $499 plus free shipping (normally $599 - use coupon code HZVT1HBJHFJP02). • Griffin PowerDock 2 Charging Cradle for $28.49 plus free shipping (normally $49.99). • Samsung Blu-Ray Player (recertified) for $169.99 plus free shipping (normally $199.99). • Curtis Mathes Blu-ray Player for $169.99 (normally $269.99). • Logitech Harmony 520 Universal Remote Control (refurbished) for $42.99 plus free shipping (normally $64.99). 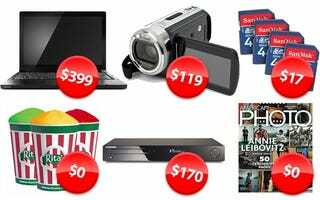 • Polaroid 720p HD Camcorder for $119 plus free shipping (normally $299.99). • Philips GoGear 2GB MP3 Player for $19.99 (normally $32.95 - valid today only). • SanDisk Sansa Clip 2GB MP3 Player for $27.99 plus free shipping (normally $59.99 - use coupon code EMCLPMX24. Valid through 3/31). • Pentax Optio Z10 8MP Digital Camera for $89.99 plus free shipping (normally $99.99). • 4GB SDHC Flash Memory Card - 4 Pack for $16.99 (normally $46.99). Sorry—deal expired. • The Man from U.N.C.L.E. 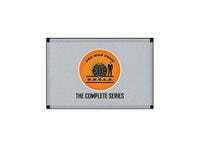 - The Complete Series on DVD for $82.99 plus free shipping (normally $199.92). • Dark Angel - The Complete Series for $33.49 plus free shipping (normally $79.96). • The Bourne Identity Widescreen "Explosive" Edition on DVD for $7.37 plus free shipping (normally $14.95). • Bourne Supremacy on DVD for $7.37 plus free shipping (normally $14.95). • Rita's Italian Ice for $0 (valid today only until 10PM at Rita's Italian Ice locations only). • Subscription to American Photo Magazine for $0. Sorry—deal expired. • Thomas and Friends Wooden Train for $0 (valid 3/21-3/22. In store only). • Potty Training Charts for $0. • Three Grand Theft Auto IV Songs for $0. • All-Bran Pink Lemonade sample for $0. • Small Business Success eKit for $0. • Mailing Address Labels for $0 (be prepared for junk mail). • Paul Mitchell "Head for Change" Hair Product Sample for $0. • Dove Hair Therapy System Samples for $0. • Roots of Nature Remedies Sample for $0. • GP-X Marker for $0. • Pogo Tokens for $0. • Mary Kay Ultimate Mascara Sample for $0.